Boarding…. The longer a dog stays, the less they pay…. Dogs dropped off before 3pm are charged a daycare rate on the first day only….. Dogs dropped off between 11a-3p are charged a ½ day of day care. I also have a special, that I call the “in and out” dog arrives between 3p-6p and leaves before 9am $18 first dog $16 for additional dogs. Safe: All dogs are supervised overnight. Fun: During the day your dog will get to play with other dogs. And we structure play time with them as well. Secure: The dogs are not isolated from one another - so they don't feel afraid to stay overnight. *Kennels are available for dogs who prefer them – for NO additional charge! Well Cared For: We'll be sure your dog gets only the food she/he is accustomed to eating because we have separated feeding areas. Special needs If your dog is on medication we will be sure to dispense it according to your vet's instructions – for NO additional charge! We have all supplies: Please bring ONLY your dog's food. We've got everything else a dog could love and need. 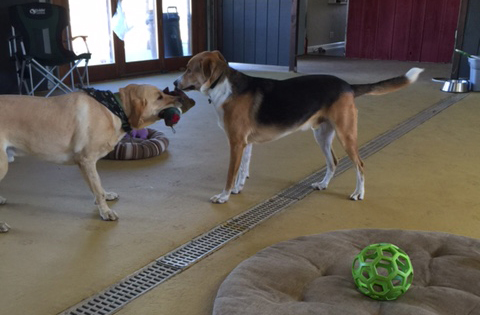 We suggest a half or full day of Doggie Daycare at Playful Paws, LLC before boarding. This will help your dog(s) to feel more at home.